The month of fasting (and over-eating) is progressing towards the end, but what makes this Ramazan more special is the fact that it is coinciding with monsoon. The clouds in Karachi seem ready to pour any moment now – please, God, please? Monsoon and Ramazan have nothing in common save for a garma garam (piping hot) plate of pakoras. This Pakistani staple is a must-have for iftar and any dastar-khuwan (dining table) is incomplete without a variation of this. 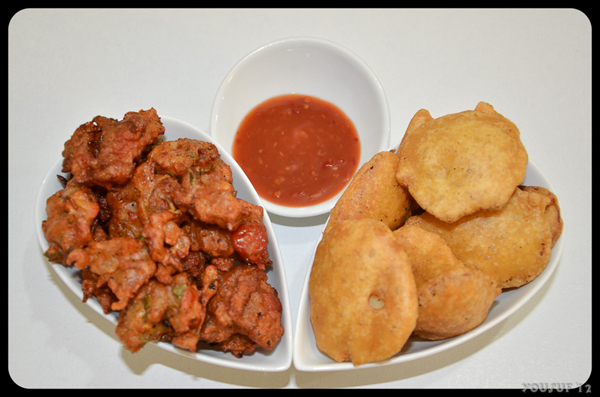 The popularity of pakoras lies not only in their unique flavour profile but also in their affordability. 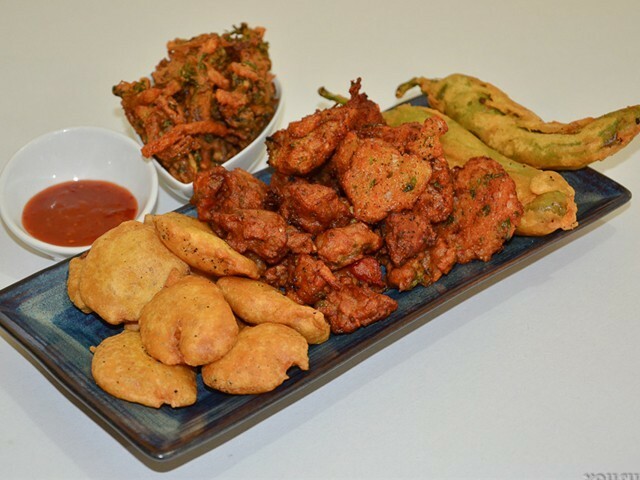 Pakoras or Bhajiyas are savoury snacks deep-fried to a crisp and served with a dash of chaat masala with ketchup, tamarind chutney or chilli sauce. 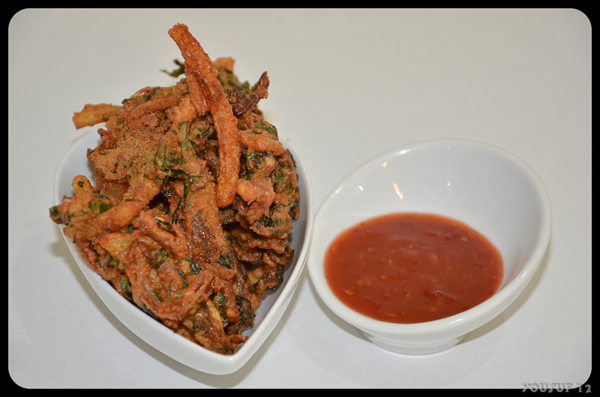 Cultures across the world have their own adaptation of pakoras. The English have fritters, the Chinese call it dumplings, and for the Japanese it is tempuras, but nothing beats the satisfaction of a crunchy pakora at the time of iftar. This notoriously popular snack is light on the taste, heavy on the waist, especially if it is deep-fried in ghee. So no matter how tempting it may look, do not, I REPEAT, DO NOT give into the temptation of finishing up the entire platter in one go. 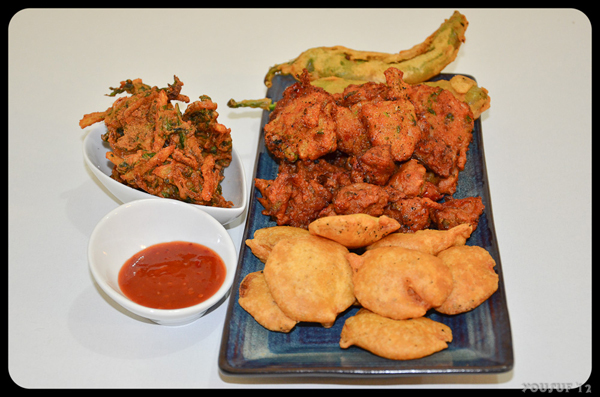 Pakoras, and most of its other variations are made using gram flour (baisan), but some adaptations include corn flour, pearl millet (bajra) flour and all-purpose flour. Also featured in the pakoras is a mixture of edibles including potatoes, tomatoes, spinach, onions, cottage cheese, unripe mangoes, eggplant, and green chillies. These can be found in all shapes and sizes across the country with practically every street-vendor peddling them. As with any street food, it’s better to keep the hygiene factor in mind, with all the parasitic and bacterial diseases out and about. So, let me show you how we can make not one, but FIVE different variations of this phenomenal snack within the confines of your own kitchens. These pakoras (popularly known as bhajiyas) require very little time and effort and can be made in a jiffy, ergo, the name Jhat-pat. Ideally, these are served with a side of yogurt mixed with some red chilli powder and salt. 1. Mix gram flour, baking soda and salt in a bowl with some water to form a thick batter, to the consistency of condensed milk. 2. Heat oil in a wok, dip each slice of potato in the gram batter and drop it into the wok. 3. Deep fry on medium heat till golden brown. These pakoras are slightly different from the rest in taste as well as texture, mainly because the only spices and sauces used are of traditional to Chinese cooking. You can also substitute chicken in the recipe with shrimps. Since this is originally my wife’s recipe, I dedicate this section of the write-up to her. 1. Once the chicken is marinated, add all the vegetables, corn flour, gram flour, soy sauce, chilli sauce and salt to the chicken and mix well. 2. Heat oil in a wok, take a teaspoonful of the mixture and drop it into the wok. 3. Deep fry on medium heat till slightly dark brown. Note that these will take a slightly longer time to cook as you need to ensure the chicken is tender. These are essentially similar to the pakoras you get at the street vendors’ – the only difference being the cutting style of the vegetables. Using a julienne cut for the vegetables ensures that the pakoras come out extra crunchy and extremely delicious, instead of just turning into a doughy mush. Do not forget to sprinkle some chaat masala over them before serving. 1. Put all ingredients in a bowl and mix well. Add enough water so that the resultant mixture becomes sticky. These are slightly unconventional pakoras in the sense that they do not use gram flour. Instead, these are made entirely using Mung beans (moong dal). This is one recipe that was carried over from India to Pakistan and has been in the family for many generations. 1. Soak the mung beans overnight and remove all the green skin before grinding it in a blender with the garlic cloves. Use the wet mill attachment so as to eliminate the use of water. 2. Once the beans are blended, add all the vegetables and spices to them and mix well. 3. Take a teaspoonful of the mixture in your hands and flatten it into the shape of a patty. 4. Drop it into a pre-heated wok with oil and deep fry on medium heat till golden brown. 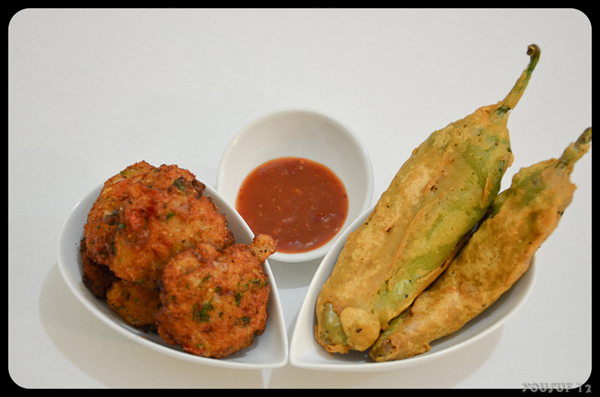 Moong Dal Pakoras (left) and Chili Pakoras (right). These pakoras use the chilli as a container for an assortment of spices and are then deep fried with a crisp gram flour coating on top. The type of chilli used is entirely up to how much heat you can take during Ramazan. This recipe uses banana peppers. 1. In a frying pan, add the cumin and coriander seeds, and toast them till they are nice and crisp. 2. Take a mortar and pestle and coarsely crush the cumin and coriander seeds. 3. Now add the chaat masala and the lemon juice to the crushed seeds and form a thick spice paste. 4. Take each banana pepper, make a vertical slit using a knife, and stuff the spice paste into it. 5. Mix gram flour, baking soda and salt in a bowl with some water to form a thick batter to the consistency of condensed milk. 6. Heat oil in a wok, dip each pepper into the gram batter and drop it into the wok. 7. Deep fry on medium heat till golden brown. I hope you enjoy these pakoras at home but before I sign off, I’d like to add my two-bits about the essence of Ramazan. Never in my life have I ever heard anyone losing weight during Ramazan. This month is not just about giving up food and drinks for a prescribed amount of time. It’s about moderation, preservation and self-control. Moreover, it teaches us the ever-important lesson of sharing what Allah has bestowed upon us with those who cannot afford it. So don’t forget to share with those in need, even if it’s some money, clothes, or something as insignificant as a platter of pakoras. The Lantern: Lighting up Karachi, the oriental way! chicken pakoras, the other recipes ARE being made, on one a day basis here.